I like to think of myself as a vocal introvert. I’m content spending a quiet day at home, but when I get around my friends or like-minded folk, I’ve been perceived as and called a social butterfly with an outgoing personality. I’m a self-described goal-getter whose is not ashamed to talk about my victories nor my setbacks. I’m a youth speaker and author, and my main topics are self-esteem and media literacy. 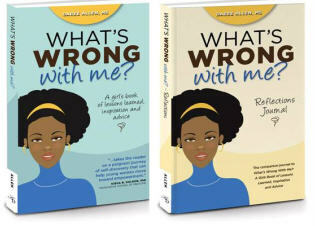 My first two books are part of a series, “What’s Wrong With Me?” Part memoir, part self-help, What’s Wrong With Me? encourages girls to embrace their uniqueness and stay close to God. I’ve won awards for my writing, which I’ve been doing since I started journaling at age 12. I’m a technical writer now, by profession, and I’ve done some freelance writing here and there, but my old friends from high school can tell you about the witty soap opera scenes I wrote in a Composition book in the 10th grade. These days, I spend my leisure time reading, writing, and watching movies with her husband George and her daughter Kaia (also known as “the girl” or “Mini-Me”). You can read more about me on my writing and speaking website, D.elivering A. R.ich, E.mpowering E.xperience, but that’s the basics. I hope you hang out for awhile as I continue to write about my life, my struggles and revelations, and the things and people I love. I have read your bio and several of your posts and I really like what you’re doing here. I would love to have you share some of your posts with us at The Black Man Survival Guide and possibly contributing something to your site. Looking forward to connecting. I just wanted to let you know that we, E&E Publishing, have two forthcoming books for writers targeting the YA market: one for fiction, and one for nonfiction. The author is Marilyn Cram-Donahue. If you would like me to add your name to our mailing list, so you can be notified when the books are published, please contact me. I am the Publisher of E&E Publishing. You can add my name to your list. Thanks. I regret that I missed this teleseminar. I noticed that Daree has an interest in helping teenage girls. I have just self-published a program manual for pre-teens entitled BFF: Be Friendship Focused. It is a self-empowerment / anti-bullying program that is so user friendly, anyone could easily lead this 10-week process. What also sets this apart, is the self-empowerment exercises are based upon universal laws such as gratitude, forgiveness, kindness, acceptance, etc. and lessons for spiritual enlightenment are encouraged throughout this program. this is an opportunity for children to grasp life skills that will sustain them prior to entering middle school and beyond. Please view my website to learn more. I also am a gifted intuitive writer and write healing letters for adults with relationship concerns. Enjoy your life on purpose! Hey! Rere… Longtime no see or hear… It is good to see that you are doing well… I have yet to get a cheesecake from you; hope to order one soon maybe for my birthday… this month. I will try to either tweet you or send another e-mail message… just to keep in touch.